Using advanced mapping techniques, scientists are trying to predict when and where fast-flowing glaciers in Western Canada could change the surrounding ecology—and put nearby infrastructure and fisheries at risk. "There is a type of behaviour we call surging, where the glacier—which has been flowing slowly for a long period of time—suddenly goes nuts and starts flowing up to an order of magnitude faster than before," explained University of Alberta glaciologist Martin Sharp. "You then get a mass of ice travelling very rapidly down the glacier, probably because of the buildup of water trapped beneath the glacier, on which the glacier effectively floats." The changes in flow can result in flooding and damage to infrastructure when the stored water eventually escapes from the glacier, explained Sharp. He added that the changes can also affect sea levels and iceberg production (see sidebar), as well as the ecology of critical headwater streams, glacier-fed lakes, and fjords at lower latitudes. The escaping water tends to be highly charged with fine sediment that was eroded from the glacier bed during the period of fast flow. The sudden input of this sediment into the glacier-fed streams can affect everything from downstream water temperatures to fish ecology and rates of sedimentation in proglacial lakes and even reservoirs. 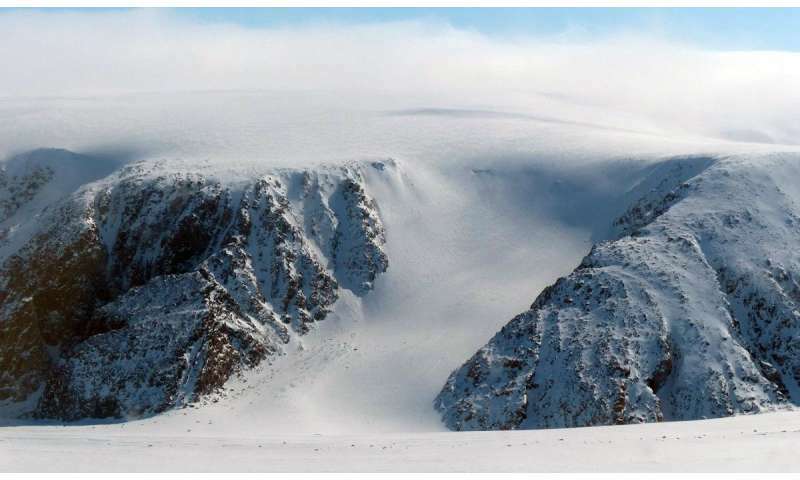 Sharp explained the scientists are trying to understand whether these surges and other less dramatic changes in glacier velocity are a direct response to changes in climate or a result of dynamic instabilities in the ice. A multi-temporal mapping approach is allowing them to identify which glaciers pose the most risk. "The technology has developed so much that we can now map the flow rates of the entire Canadian ice cover, providing the possibility of routine monitoring to track exactly where and when rates of flow are changing," he said. Sharp, who has been studying the ice dynamics of glaciers in Canada since the early '90s, noted there have been big changes in the approach used to do the research. Thanks to the open availability of data from satellite radar and optical remote sensors, scientists are now able to automate the mapping and monitoring of large glaciated areas to provide a more holistic perspective on changing glacier behaviour. "Because we now have regular data streams, we can start to see events that probably went largely unnoticed in the past. While not all glaciers have very variable flow rates, a surprising number do. We now see there's a much bigger spectrum of flow variability than we used to think, even though we don't necessarily understand exactly what's driving it at this point." The new study provides the first picture of how fast all the glaciers in Western Canada, from Yukon to British Columbia to Alberta, are flowing. It is the final piece of a 13-year effort by scientists from the universities of Alberta, Ottawa and Lethbridge, and Natural Resources Canada, who combined data from both optical and radar-based remote sensing to present a fuller picture of change in the ice and how it potentially affects everything from sea level to infrastructure and ecology. "Surface Velocities of Glaciers in Western Canada From Speckle-Tracking of ALOS PALSAR and RADARSAT-2 Data" was published in the latest issue of the Canadian Journal of Remote Sensing.